Cristina Martinez arrives at work at 4 a.m., ties a white apron high across her chest, and starts preparing a lamb cooked in vapor for 10 hours. An hour later, she and her husband, Ben Miller, open their South Philadelphia restaurant, Barbacoa, serving premium tacos - and hefty sides of activism - in their bid to mobilize restaurateurs on behalf of the many undocumented immigrants who work in America's kitchens. 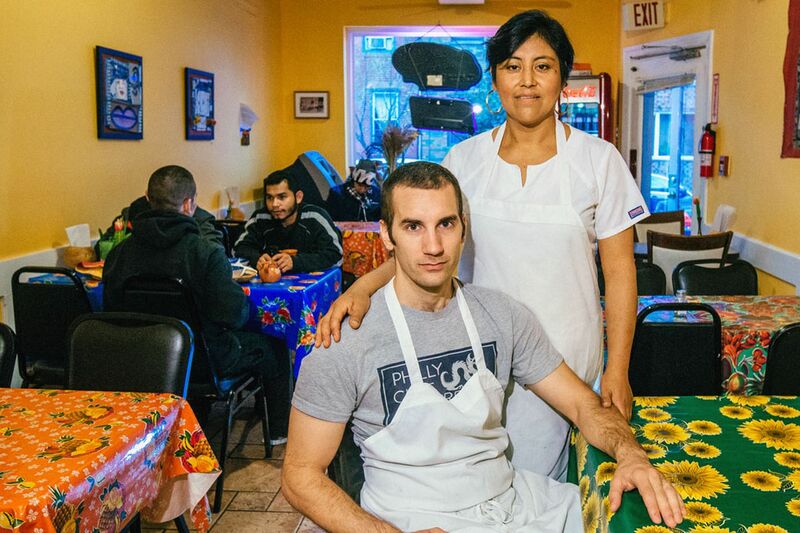 Hosting organizational meetings and screening documentaries, the couple hope to spark a culinary crusade in a city famous for its restaurant scene - and pressure the deadlocked Congress to overhaul the immigration laws. "Mexican undocumented workers are in every restaurant in this country," Miller wrote in one online post. "They cook, clean, and busboy for Marc Vetri, Steven Starr, Jose Garces, every hotel, every university dining hall, and in our restaurant . . . as well." It's no secret that immigrants, many of them undocumented, are essential to America's $550-billion-a-year restaurant trade. The Pew Hispanic Center has estimated that 20 percent of the nation's 2.6 million chefs, head cooks, and line cooks are here illegally, as are 28 percent of the 360,000 dishwashers. "All I want," Miller said in an interview, "is for some chefs to step up and say, 'Yes, we are in favor of making a way for our undocumented workers. They matter.' "
The Philadelphia-area restaurant all-stars who Miller has called out on Facebook have thus far stayed silent. A spokeswoman for Garces said he declined to comment. Neither Vetri nor Starr responded to multiple interview requests. But others said Miller's message begs an important conversation. David Suro, a native of Mexico who opened the Center City restaurant Tequilas 29 years ago, estimated the city's commercial kitchens and dining rooms employ at least 1,500 Mexican immigrants as cooks, servers, busboys, and dishwashers. He said his policy is in line with what he believes is true of the other major restaurant employers: "Anyone hired must have papers." That's not always so easily determined, Suro said, acknowledging the possibility of forgeries. "But they pay their taxes" through payroll withholding, he said, "and are very hardworking." Tom McCusker, chef-owner of Honest Tom's Tacos in West Philadelphia, supports Miller as someone who "kind of broke the barrier to talk openly about this." But he said Miller needs big-name support if his cause is to get lift. "If one of those dudes signed off," he said, "we could run with this." What Miller, 31, has in mind is a movement built on the testimonials of prominent chefs who might be more comfortable talking about a sensitive subject if they tackle it together. He wants the federal government to create restaurant guest-worker permits so workers can "travel home for five days at Christmas," or attend family funerals, without fear of arrest. He wants recognition that anyone who dines out benefits from the labor of immigrants, many of whom are undocumented. A quirky, unlikely standard bearer - who said he lived in shelters for a while and pleaded guilty to a misdemeanor indecent assault charge a decade ago - Miller said his knowledge of the restaurant scene comes from having worked at two prominent Philadelphia eateries alongside people he knew to be undocumented but otherwise upstanding. "While they are here, they are paying taxes," he said. "They are consumers, shopping at the Acme, willing to do the [low-level kitchen] jobs . . . that kids who come out of culinary school don't want to do." His desire to use Barbacoa as a platform for social change, he said, is driven largely by his love for Martinez. They met working at another restaurant, and married in 2012. She was a 6-year-old in Mexico, she said, when her mother and father taught her to cook the succulent barbecue they sold at open-air markets. Forty-six and moonfaced, with black hair in a tight bun now, she moves by rote in Barbacoa's kitchen, where her thoughts often turn to her daughter, Karla, 23, a nursing student in the Mexican state of Michoacan. Martinez said she came illegally to the United States in 2009 to earn money for Karla's tuition and expenses, about $2,000 monthly, which was unattainable as a barbacoa peddler in Mexico. Then a single mother of four, she had made the perilous trek across the desert to the U.S. before and knew the drill: a bit of peyote to battle fatigue; a plastic bottle to scrounge water from cow troughs; the clothes on her back. Caught by U.S. Border Patrol and fingerprinted in 2006, Martinez has an "unlawful presence" on her record, which makes her ineligible for a green card despite her marriage to Miller, a U.S. citizen, who was raised in Easton, Pa. Among the hardships of being undocumented, she said, the hardest is being unable to go home to see her family and return to Philadelphia without another desert crossing and at least $8,000 to pay the human smugglers. She could leave and try to return legally but the law bars people with her immigration status from applying for 10 years. So the couple behind Barbacoa, which began as a lunch cart near their home on South Eighth Street, and opened as a storefront on South 11th in July, saw no alternative but to add movement-building to their menu. On Sept. 20, with 25 people in attendance, they screened the documentary The Hand That Feeds, about working conditions at a New York City sandwich shop. A meeting to discuss an unspecified "direct action" campaign to take effect in the spring is scheduled for Nov. 8. Miller imagines a "show of solidarity" in which restaurant owners would close for a day and issue a joint statement to raise consciousness about the needs of the industry's workforce. The National Restaurant Association, the country's largest restaurant industry group, has lobbied Congress for immigration reform, including "a path to legalization" for undocumented immigrants. The industry has a lot of power, Miller said. "Of course, it's a personal story, with my wife and me," he said. "But it is also about our customers and colleagues in food service. We want these people to have stability and comfort." He said he's not advocating just opening the borders. But he wants debate. "Donald Trump has his podium. He has his microphone," Miller said. "We can't let that be the only one." There is some precedent for prominent people, including former New York City Mayor Michael Bloomberg, speaking out on immigration. "Our businesses broke the law by employing them," he told Congress in 2006. "[But] our city's economy would be a shell of itself had they not, and it would collapse if they were deported." Speaking to the Congressional Hispanic Caucus last week, Washington, D.C.-based restaurateur Jose Andres, who recently backed out of a deal to open a restaurant in a Trump hotel after Trump disparaged Mexicans and called for mass deportations, echoed the sentiment. "Who is going to be feeding America," said Andres, "if we kick [out] everybody that is feeding America?" For Barbacoa, immigration reform is about human rights and skin in the game at every level. "I'm not saying anything that controversial," Miller said. "I just don't want it to be an option for a chef to look the other way."